(Spanish American War Patriotic) "11 C" Waving Flag, 11th Cavalry, U.S.V., Manila, P.I., black patriotic design on cover bearing Philippines 2¢ red (214) tied by "Mil. Sta. No. 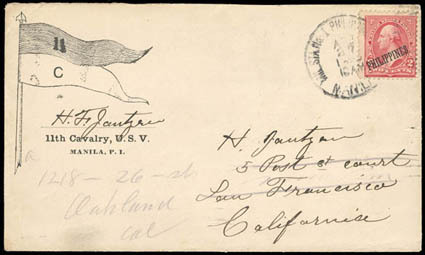 1 Philippines, Manila, Apr 27 1900" cds to San Francisco Cal., forwarded upon arrival to Oakland, reverse with San Francisco Sta. A. (6.2) machine cancel and Oakland (6.2) arrival cds, Very Fine and scarce design. A link back to Sale 75 - Lot 175, along with its description, will be appended to your message.